I didn't plan to write a blog today. Throughout my day I felt like nothing interesting was happening, but after recounting my day to my mom on FaceTime tonight, I realized that it was a pretty good day, and some things were worth writing about. After my expedition of hiking yesterday, all I wanted to do today was relax. I went to bed early, and woke up early around 8am. I spent a few hours laying around in bed, surfing the net, etc. 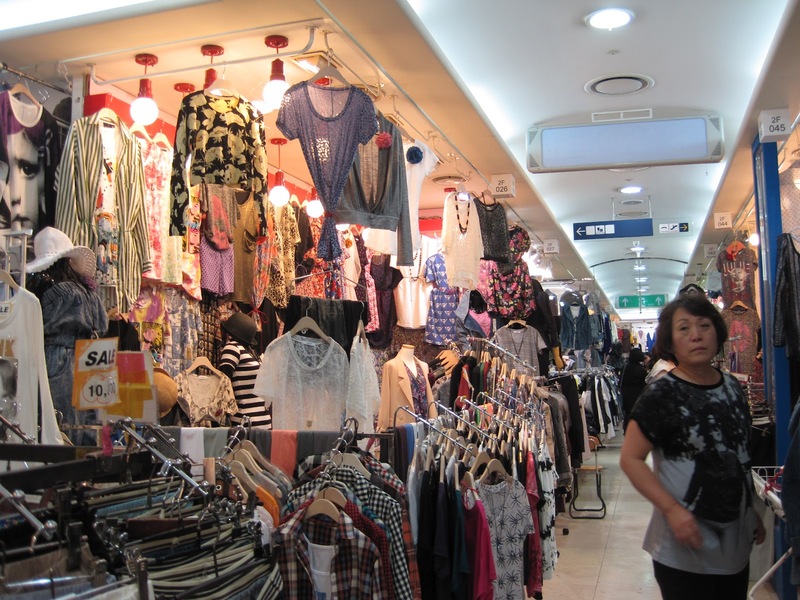 I decided that I wanted to go to a few department stores in Myeong-dong, just to window shop. I haven't gotten paid yet (well, a real pay check at least). So I don't really have money to play with. I'm not hurting, but I try to keep my expenses below $50-75 each week, including transportation and food. After an extensive conversation about fall/winter fashion and what kind of coat I should invest in with my ZTA Big, Kristen, I headed out. I got slightly turned around on the subway, but I figured out it was not my fault but the Seoul Subway app! At a specific station, it tells you to go in the wrong direction than you should. Good thing I'm awesome at directions (thanks dad!) and figured it out before getting on the wrong train. I had to backtrack a little, but I corrected before much harm was done or much frustration ensued. 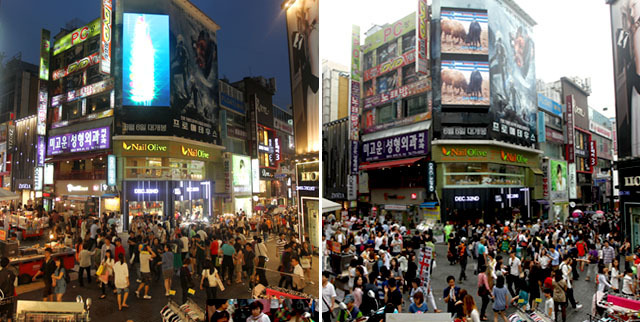 When I got to the stop, I headed to the main Myeong-dong street. I wondered through a few large stores, found nothing spectacular and prices slightly higher than I wanted, so I headed back out on the street. A little further down, I went into a building looking for Forever21 but instead found a quirky shop boasting funky household items, eclectic jewelry, and about 50 brands of stationary. I was absorbed by the stationary section - it was like Urban Outfitters but only pencil cases, diaries, planners, and notebooks. I absolutely loved this store. One thing I found (and ultimately invested in) was a kit for hanging photos the Korean way: along a string from clothes pins. It's the cheapest way to display many photos without taking up precious countertop/desk top space. I bought the kit, and plan on hanging my Instagram prints when they come in. I also found a cute journal with pages just like I like, which I could never find in America. In total, the 3 things came out to a little over 11,000W (~$11). I looked at that store for at least 45 minutes. It was awesome. 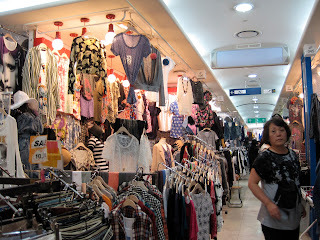 After that, I sifted through Forever21, Zara, and street vendors' wares. I wandered all the way down to another subway stop (I can't believe I walked that far!) and found a department store I had read about called Migliore, which ended up being a weird combination of a department store and a market. There were stalls with separate vendors, and I saw some great olive pants at one stall. As I felt them (actually made out of decent material, instead of the horrible material most Korean pants seem to be made out of), the shopkeeper came over and asked my size. I asked the price (33,000W) and showed less interest. She offered 30,000W and insisted I try them on. I looked around dubiously, since the store was about 10 sq. feet. She motioned for me to come "in" (aka: 1' wide x 6' long space between the racks and her inventory), and she hurried away. I inspected the pants some more, and the shopkeeper came back into view with some cloth in her hand. What the stalls look like inside Migliore. This bundle ended up being a large skirt, which was my dressing room. I had to put the skirt on over my pants, take off my pants beneath the skirt, put on the pants I was interested in, then take off the skirt to see the result. It was a complicated and hilarious process. The first pair (size L) were too big (yay!) so she put a size M in my hands, and I donned the skirt once again to change into the smaller pair. This pair ended up being a better fit, much better actually. I was surprised. The material felt like cotton, but stretched nicely. I grabbed the calculator used to show the price, and offered her 25,000W. She shook her head, took the calculator and said 28,000. I agreed, and started to take off the pants. The shopkeeper started speaking animated and worried Korean, and I realized I didn't have the "dressing room" on! Oops! I probably embarrassed the crap out of her, but I had only unbuttoned the top button and started the zip when she got her point across. I changed beneath the safety of the skirt, and paid for my new pants. After walking about 10 feet from the shop, I realized that I already have olive pants. What was I thinking?! Oh well, not returnable, plus these were of a different style. And olive is a popular color this season (or so I've read online). I shrugged my shoulders; I got pants but also quite an experience with the skirt/dressing room and also bargaining via calculator. After this great purchase, I wondered the side streets in search of the shop where I purchased my purse a few weeks ago. All the bags were $10, and I could use another, plus figured that would be an affordable and cute souvenir for my friends. I ended up not finding it, but did find a dress/shirt set for 10,000W (black maxi dress with a dark grey long sleeve shirt overtop), and purchased that despite the store having neither a dressing room or a skirt to assist in deciding if it would fit me. It was one-size so I just took a chance. When I got home and tried it on, I was pleased to find out it did in fact fit. By this time, I was starving. Myeong-dong has tons of street vendors selling socks, tights, purses, glasses, wallets, belts, and scarves. They also have just as many vendors selling various fried things (think squid, bug larvae, fish cakes, etc). One of these things, which I had seen on my previous trips to Myeong-dong but never tried, was a "Tornado Potato." 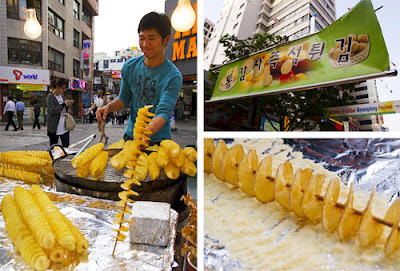 Basically, you watch the potato get spiral cut, twirled around a stick, and deep fried before your eyes. It gets rolled lightly in some cheesey powder, and 2,000W later, you have yourself the most delicious version of potatoes in the entire world. This is better than french fries, better than anything you can get at the rodeo, and I think the HLSR should consider putting these ajummas and their carts up this Feb/March. Heaven... It was about 2' long and totally awkward to eat around the stick, but so worth it. Being alone with a 2' long stick of heaven in my hands, I was unable to take my own photos, so I had to steal from another website. This was the best one, and I credit it to http://www.seriouseats.com/2009/05/snapshots-from-south-korea-fried-things-on-sticks.html. I got home and watched some movies and TV. I was so thankful that my day was so relaxing. It was nice to be out and about, but spending some time with myself. Only one more week til vacation!! Speaking of... I need to do some more research! Goodnight! That tornado potato sounded really interesting. It made my mouth water for french fries. I haven't had any for soooooooo long. Keep up the blogs Chels. I really enjoy reading them and have actually forwarded some to one of my friends that I walk with. I tell her about my family and she tells me about hers to make time go faster on our walks. She feels that she knows all of you and is interested in what each of you are doing. Hope you don't mind.